Driving Under the Influence, of Life. Certain lessons we must learn firsthand, no amount of lecturing or warning by others will suffice to teach us. Such was the case with my hard-learned lesson regarding driving under the influence. I am not writing to convince others not to drive under the influence. More so, I am inspired to share how my own DUI experience changed my way of thinking. I remember first being lectured on the topic in fifth grade, when Officer Price paid weekly visits to our classroom as part of the D.A.R.E Program, in the eighties. I won the D.A.R.E award that year and pledged never to use drugs. I was finally ready to face my life with honesty. A new friend had generously invited me on an all-expense-paid trip to explore the energy vortexes of Sedona, Arizona. She asked me to drive her car from Los Angeles because she had injured her knee. She kindly provided the marijuana—of which I took less than one hit from a vaporizer pen I did not know how to operate, while still in L.A. I suggested that she put her stash in the trunk, but she didn’t think it was necessary, she wanted to continue to smoke while I drove. “He just turned his lights on,” I said, trembling. “Oh, my God!” she shrieked. The cop smelled the weed the second I rolled down the window. My heart plummeted to my feet. I was hearing the words that were never supposed to be directed at me. “I’m being arrested for DUI!” I yelled at my friend, who was sitting on the side of the road, cuffed, as I was led to a police car. We were booked. My blood was drawn. Our hands and feet were shackled. We were taken in a prisoner transport vehicle, to Maricopa County Jail—where we spent the next horrifying 24 hours. When we were arraigned, the judge ruled that, while we were awaiting sentencing, we were not to consume alcohol or illegal drugs. Her words of warning planted the seeds of change in me. I was petrified of spending even one more night in jail, which was still a real possibility. After four months of torturous waiting, I was informed that Arizona had indeed filed charges against me, when my blood test results confirmed that I had 2ng (billionths of a gram)/ml of inactive marijuana metabolite in my blood—the THC had already been metabolized, and was, therefore, no longer causing impairment at the time of my arrest, but Arizona is a Zero Tolerance State. My Blood Alcohol Content was 0.0. Six months later, I was finally convicted: DUI Impaired to the Slightest Degree, and sentenced. At the end of the day, the ordeal cost me: 26 life-changing hours in custody, approximately $20,000, thirty hours of DUI School, six mandatory AA Meetings, eight hours of traffic school, 20 hours of substance abuse counseling, three months suspended license, six months driving with an ignition lock device which I blew every 15 minutes while driving ($200 to install / $80 for monthly calibration), costly SR-22 insurance and two trips back to Arizona. The chances of the law changing right when it did and my attorney managing to get my case dismissed were slim to none. It took me two years to release my anger toward my friend (for forgetting that her tags had expired) and to accept full responsibility for my own decision-making leading up to our arrest. The truth is, I am now grateful for the experience. My DUI debacle gifted me with the inspiration to get sober and to take control of my life, which had become unmanageable. After 20 years of habitual pot smoking, an addiction I had desperately tried to kick so many times I finally deemed it hopeless, I have not taken another hit of marijuana, since that fateful day. When charges were finally filed against me, my fear of going back to jail became debilitating. I was beginning to realize how much red tape was in front of me, and that I would need a clear head in order to effectively satisfy my court orders. I knew deep down that I could not manage the tasks at hand while engaging my roller coaster relationship with alcohol. I sank to my knees in the middle of my living room and asked for guidance. The answer came back loud and clear: quit drinking. The next day I attended my first of 90 AA meetings in 90 days. The spiritual tools I picked up helped release me from having fear’s grip around my neck. We cannot change our past, but we can change our future. We can change our karma at any given moment, and I believe that is what I have done, by getting sober. Although, ironically, I was legally unimpaired when I was arrested, I had been driving under the influence since I was 17-years-old, 20 years! It is a miracle that it did not happen sooner. Looking back at my life, I remember (well, sort of) driving with one eye open, in order to alleviate double vision, driving with my knee so I could use both hands to smoke from a bong, asking friends in the morning: “Who drove home?” to their response: “You did,” hunting the streets of Los Angeles to find where I had parked my car. I was hardly concerned with driving under the influence, or countless other irresponsible actions I had grown miserably accustomed to taking. I was on a fast track to nowhere good. Over the course of ten spiritual weeks in DUI School, I learned that most newcomers, after some probing, admit their DUI was “bound to happen.” Like Russian roulette, it is a numbers game—one of those risks many people take until the day they get caught. Everyone in the class swore they would never do it again. However, there were students on their second and third DUI. Some claimed they only had one drink, okay, maybe, two! Most of us had spent, or were facing, time in jail. 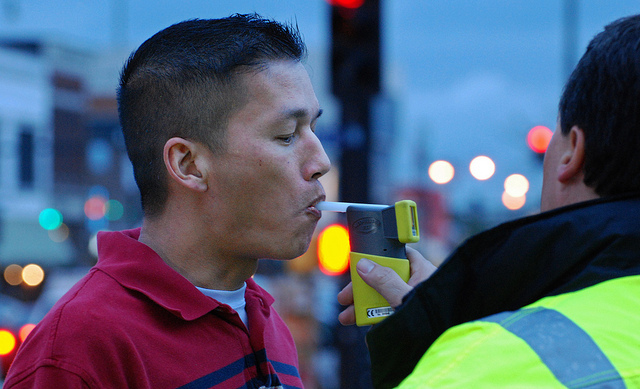 With today’s laws, and especially with the convenience of car services like Uber and Lyft, driving under the influence is just begging for trouble—inviting drama into one’s life. I used to thrive on drama. I thought I would be bored without it, but it turns out life is far more invigorating drama-free. Today I understand that a step-by-step-cause-and-effect-process determines the quality of our lives. I am more present and happier than ever. I have learned the importance of clear-minded decision-making and looking ahead at possible outcomes, instead of acting on impulse. One irresponsible action can ruin a life, and it can happen fast. Anything can happen at any time. Our state of mind when it does makes an enormous difference. Having been through the hassle of a DUI, I promise it is not fun, but I cannot even begin to imagine the horror of taking another human being’s life with my decision to get behind the wheel intoxicated. I consider myself fortunate. Our arresting officer told me that a person could fatally step out in front of a moving vehicle, at no fault of the motorist, but if active THC, prescribed narcotic pharmaceuticals, illegal drugs or alcohol was found in the motorist’s blood, he or she could be convicted of vehicular manslaughter. He really got me thinking. I don’t think some people fully realize the implications of driving under the influence, or at least I didn’t. All I am suggesting is: think it through first, or, as my DUI School teacher says: don’t drive to the drink. Personally, I have been scared straight. Sober for Five Months, I Drank. Here’s What Happened. LIfe is an admixture of emotions and I am glad that you found the right emotion to carry on for the rest of your life. The combination of alcohol and driving is as deadly as dancing before the grim reaper when your time is up and he is searching for you. I appreciate the fact that you understood your mistake and learnt lessons from it. I Use to live in Sedona, don't put too much stock into comercial spirituality. Stephanie Carlisi is a songwriter, novelist, screenwriter & spoken word artist who writes as a means of catharsis and in hopes of inspiring others, even one other. She has been on a journey toward inner peace as long as she can remember and believes that inner peace, on an individual level, one by one, leads to global peace. It is about going in first, then out. More of her work can be found at her website. She can also be found on Instagram, and on Facebook.